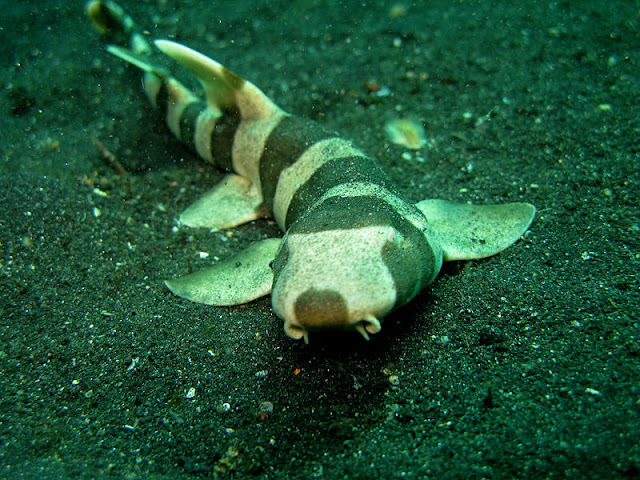 Indo- West Pacific region is the habitat of the Brown Banded Bamboo Shark. Scientists call it Chiloscyllium punctatum. The shark is a bottom dweller. 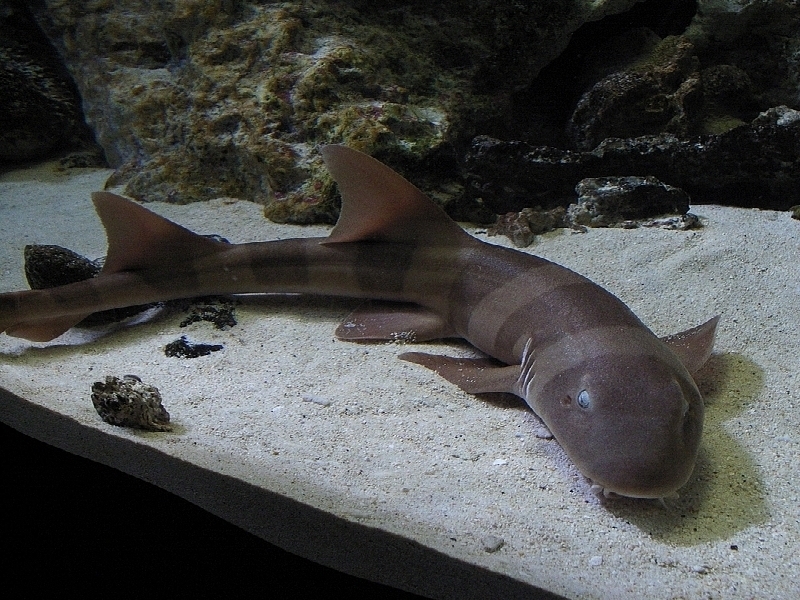 Brown Banded Bamboo Sharks are not very big in size. They rarely grow more than 4 ft in length which is almost nothing compared to a Whale Shark or a Great White. The shark got its name from the dark brown bands around its body. Actually, it is deep brown over light brown body. The color contrast is high in the juveniles but fades in adults. So, the adult specimens looks more like a simple brown colored creature. We have already known that Brown Banded Bamboo Sharks live in the region where the Pacific Ocean meets with the Indian Ocean. They like the tropical warm waters. They can be found in the coastal waters of Japan, China, Philippines, Vietnam, Taiwan, Indonesia, Malaysia, Thailand, Myanmar, India and Northern Australia. They live in the sea floors and rarely swim above it. 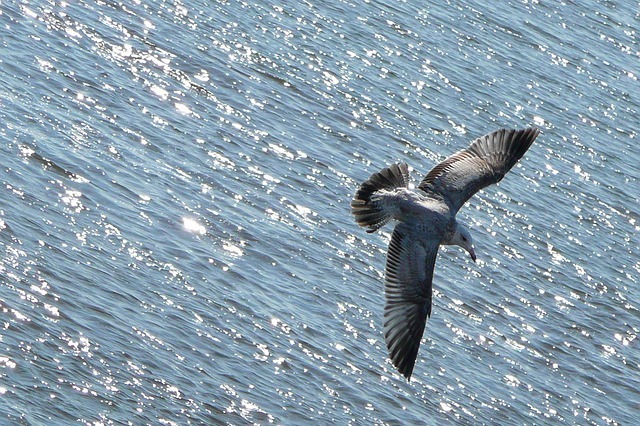 They prefer the coral reefs and rocky seabed where there are plenty of places to hide. These sharks hate light and always try to avoid it. That is why they haunt at night. The most notable bodily feature of the Brown Banded Bamboo Sharks is their long tail. The term “Bamboo” with its name came from the long, straight and round tail. Another notable feature is the disproportionately larger eyes. Their eyes are bigger because they are creatures of darkness. They always haunts at night for which such eyes are very helpful. These sharks have muscular fins. The fins are most suitable for crawling on the rough sea surfaces. These also help to roam over the coral reefs. These sharks have 4 inch wide and 6 inch long eggs. The eggs take about 4 months to hatch after being released by the mom shark. The new born baby shark is about 6 to 7 inches in size. After birth the baby grows quickly. It spends about 25 years before death due to age. Brown Banded is not very aggressive in habit. They remain still on the sea floor for hours. These sharks remain hidden from view most of the time. As they are not very active in anything, these sharks depend on catching unsuspecting fishes or crustaceans that venture near them. Bamboo Sharks are among the edible fishes and so are haunted by people for food. Every year thousands of these sharks lost their lives to the commercial fishing boats, nets and fishing lines. The overfishing of smaller fishes, shrimps and crabs also dangerous for them because they are not very active predators and so more concentration of food sources in a given area to get food. Destruction of coral reefs all over the world is another signal of death to these sharks. Due to the attractive brown bands and docile behaviors, these sharks are popular among the Aquarium collectors. Especially, they love the juveniles for being more good looking and of convenient size. Bamboo Sharks and Carpet Sharks belong to the same family named Hemiscyllidae. These sharks lay relatively big sized eggs (4x6 inch) enclosed in hard egg cases. It takes about 4 months to hatch the eggs. The species is extremely hardy. They can survive in less oxygen conditions for a long time. Brown Banded Bamboo Sharks can survive 4 to 5 hours in land. Is a Shark a Fish? Dogfish! A Shark with Venom!